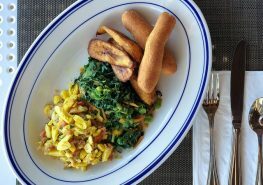 Skylark Negril Beach Resort is excited to be home to the first Jamaican outpost of Miss Lily’s restaurant, a homecoming for the beloved Caribbean oasis born in the heart of New York City. 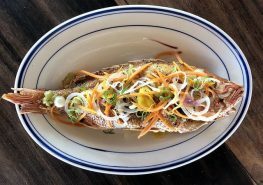 Miss Lily’s at Skylark embodies the best elements of its New York counterparts – from its modern approach to classic island cooking, friendly and cool as-can-be staff, and vibrant and colorful atmosphere. 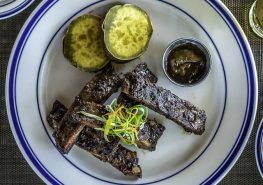 The culinary team is led by Partner and Culinary Director Adam Schop, and Kingston-born "Chopped Champion” Chef Andre Fowles. The restaurant’s centerpiece is our on-display jerk smokehouse and BBQ grilling station. Enjoy smoked and seasoned chicken, pork, and fish straight off the grill served with all the classic fixings of “yard” cuisine. 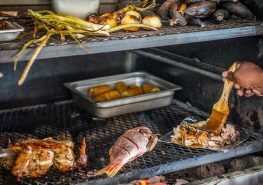 The menu also features other traditional Jamaican home cooking fare such as curried goat, oxtail and whole grilled fish. The Miss Lily’s interiors showcase Creative Director Serge Becker's signature design and passion for Jamaica with bold colors and vibrant patterns, vintage-style booths and a state-of-the-art music system. Come enjoy a vast selection of the Caribbean’s finest rums at our beachside bar. After sunset, a bit of “skylarking” will commence with bites and tropical libations featuring nightly local and international DJs spinning the latest in reggae and dancehall. OPEN FOR BREAKFAST, LUNCH, DINNER, AND DANCING, 7:30AM TILL MIDNIGHT. SEE OUR MENUS BELOW!